As you may know, Opera is a popular, open-source, cross-platform internet browser. The browser is available for Windows, Mac OS X and Linux and has been developed by Opera Software AS. First, it has been built on the Blink layout engine, but after a while, it has adopted the Chromium browser engine. Among others, it includes private browsing, tabbed browsing, a download manager and can integrate easily with social services, like WhatsApp and Facebook. 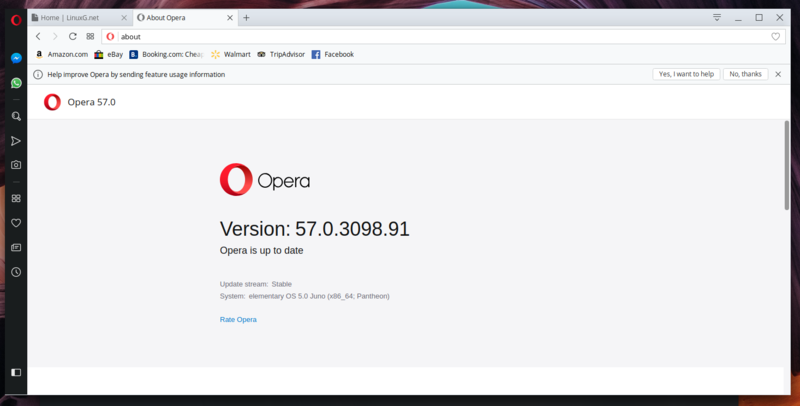 Due to the fact that it is available as a deb package, Opera can be easily installed on Ubuntu, Linux Mint and Elementary OS. All you need to do is download the package and install it via your default package manager. I prefer to use gdebi due to the fact that it also handles dependencies, but the software is not installed by default on Linux systems.